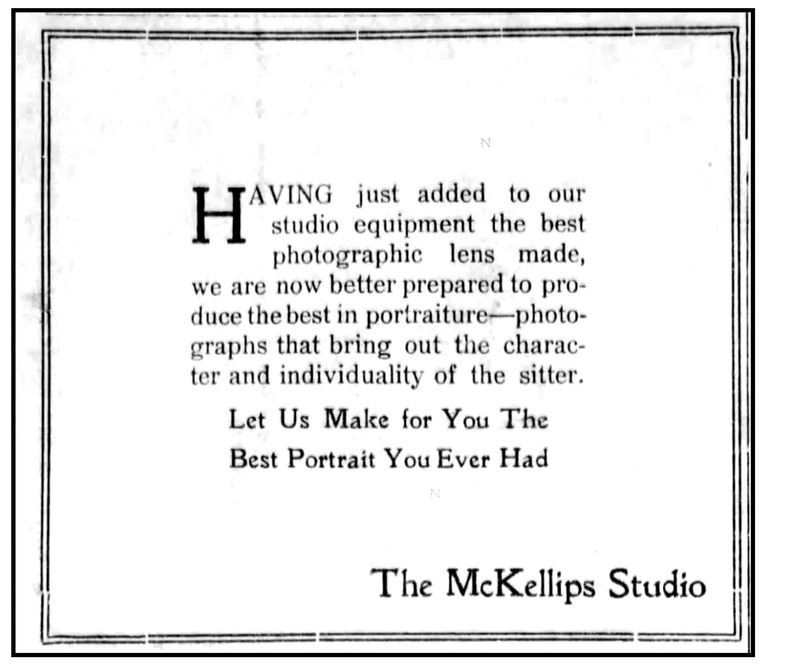 The McKellips sisters were prolific, running studios in a variety of towns. They were producing cabinet cards, portraits, photos of babies, etc., i.e. all the standard type of artisan photographer images. 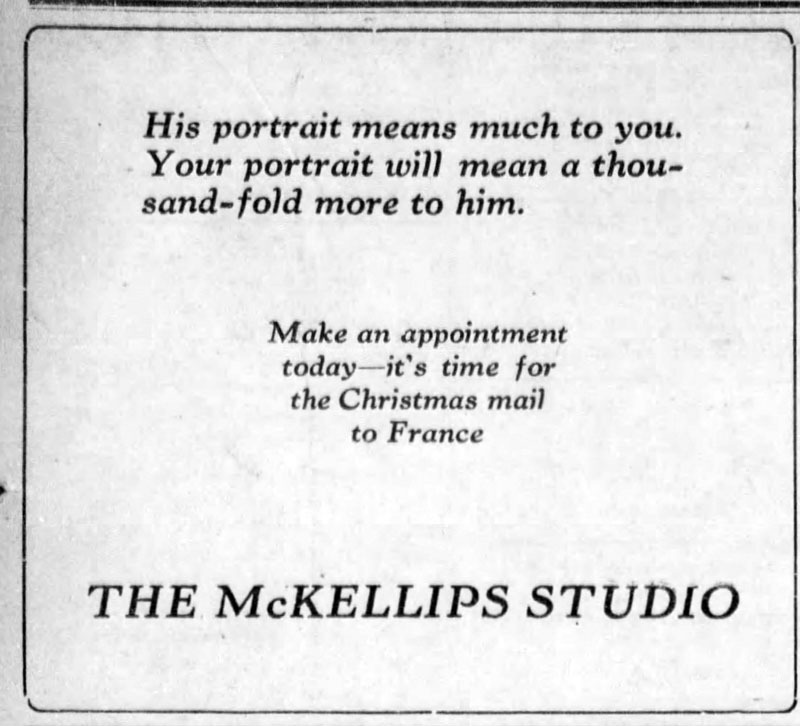 The McKellips Studio ad, Beloit Daily Call, 08/02/1915. Both Mary and Myrtle now work there. 1915 notice in the Beloit Daily Call that Mary (nicknamed Matie) has returned and will work with her sister Myrtle. Unfortunately, I haven’t yet run across any photos of the McKellips sisters themselves, nor any examples of the actual photos they took. However, when I run across them, I’ll add them to the board I made for this episode on Pinterest. Welcome to Photographs, Pistols, and Parasols, the podcast where we celebrate early women artisan photographers. I’m your host, Lee McIntyre. Today I want to tell you about two more sisters from Beloit Kansas who were also photographers in the early twentieth century. Specifically I want to tell you about Myrtle and Mary McKellips. For more information about any of the women discussed in today’s episode, check out my website at p3photographers.net. That’s letter “p”, number “3”, photographers “.” net. Now, today’s episode starts with a notice in the Beloit Call newspaper, September 23, 1909. I ran across that when looking into the Misses O’Donnell because we have a cabinet card by the Misses O’Donnell Studio. But this was curious — “Miss Myrtle McKellips”? Well, who exactly was that? 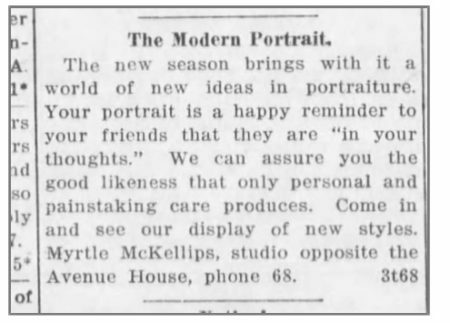 It might have been unexpected for “Miss Myrtle McKellips” to be the one to answer that ad, though, because according to notices in the newspaper, up until 1909 she had been a very popular teacher. She hadn’t been mentioned as a photographer. But apparently she got the photography bug, and she takes the position with the Margaret O’Donnell gallery, in order to learn the trade, but also perhaps to just fill in before she had something else to do in October. Let me skip to October 5, 1909, in that same Beloit newspaper, and read you a couple of the notices in the paper that day. The first one: Mr. and Mrs. Bert O. Gholson, who wed at 6:00 AM this morning at the home of the bride’s mother, Mrs M. E. McKellips, are off to Kansas City on their honeymoon, leaving on the 6:28AM train this morning. OK, that’s curious, an early morning wedding. The bride there was Ellen McKellips, who was the daughter of Mrs M.E. McKellips. But it turns out that this Mrs. M.E. McKellips actually has three daughters, and a little further down the page there’s a notice about one of her other daughters. So, this was curious. 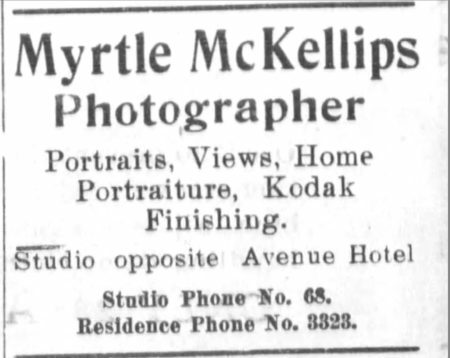 Miss Myrtle McKellip actually set up a photography studio in Manhattan, Kansas. She was from Beloit, and she started in Beloit at the Margaret O’Donnell studio, but then she goes and she sets up her own studio in Manhattan, Kansas. And over the next few years she actually is a photographer in various places, including Texas, as well as Manhattan, Kansas. But then she returns to Beloit and runs a studio there, eventually being joined by her sister Mary. Now Mary and Myrtle wind up running the studio in Beloit, Kansas for several years. They have various people coming in to help them. They open up to a second studio in another town for a while, in addition to the one in Beloit. But they wind up running the studio in Beloit until the middle of 1919, when they sell that studio. The reason [they sell] becomes clear when you look a little bit further in the newspapers, because in June of that year, Myrtle McKellips marries a man named Thomas Hill. But that doesn’t mean that Mary stops being a photographer, although Myrtle does give up photography at least for a short period of time — because [in the census] in 1920 she’s no longer a photographer. But Mary, though, Mary continues to be a photographer for several years. She moves to Concordia, Kansas and runs a studio there, managing the facilities for someone else, going to conventions, and doing workshops, and things like that, just like she was doing when she and her sister were running the studio in Beloit. Mary winds up getting married, and then sort of quickly divorced, and by 1921 is sort of bouncing around from job to job. 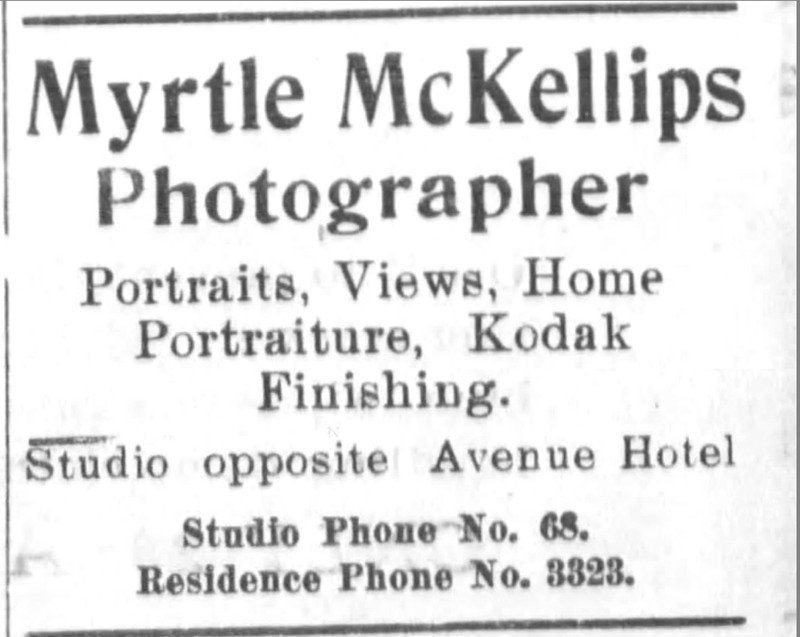 At that point, her sister Myrtle — the one she had run the photography studio with in Beloit – well, Myrtle and her husband, Thomas, have moved to Tulsa, Oklahoma. By 1922 we [then] discover a notice from Tulsa that Myrtle and Mary have opened up a new studio there. They actually bought something called the Camera Craft Studio. Mary winds up getting remarried in 1923, and she moves around, but in the 1930 U. S. census we see Mary and Myrtle and also Myrtle’s husband, Thomas, all photographers in Tulsa, Oklahoma, all working at the studio. I suspect at a studio called the McKellips studio, run by Myrtle and Mary. 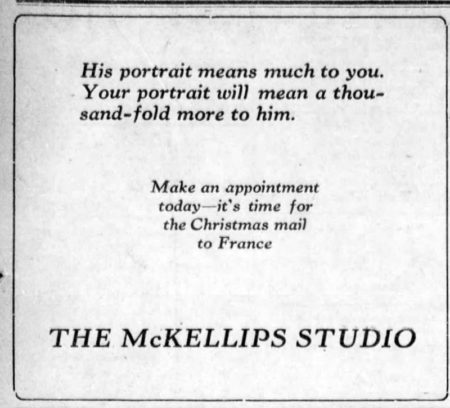 I think that there’s a studio called the McKellips Studio by 1931 at least, because there’s a clipping with a photo from a newspaper article, a wedding announcement that appears in the 1931 yearbook in the Broken Arrow High School in Tulsa, Oklahoma. and it’s just fascinating to realize that Mary and Myrtle have created [photography] careers for themselves not once, but twice. I mean, Myrtle was a teacher, but then she turned to photography, and [then] she left photography for awhile. And then she turned back to photography but was still married the second time around, so she didn’t leave photography, she actually brought her husband into the business as well. 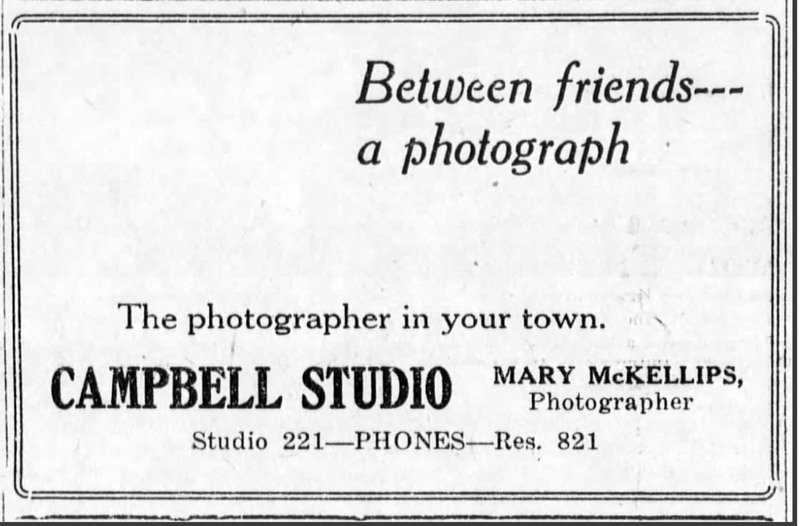 Mary, of course, came into the business with her sister in Beloit, and then continue to be a photographer for most of her career in this period. Although she does go to work for the government at one point, particularly when she is seeking a divorce from her first husband But then they are running the studio, and they’re successfully doing everything that you need to do to run a successful studio. Now, unfortunately, Myrtle actually passes away in 1931, and her husband starts to drift around from job to job. Their children actually wind up being raised by their other sister — remember that sister who’s getting married the day that Myrtle was off to start her studio in 1909? Well, that sister, Mrs Gholson, winds up raising Myrtle and Thomas’s children. Mary ultimately separates from her second husband as well. In the 1940 census she lists herself as a widow, even though technically speaking both of her ex husbands are still alive at that point. But in the 1940 census Mary said she’s widowed. But she also says that she is [still] a photographer; so she’s continued to run a studio in Tulsa. I just don’t have any information about that. But this is another case where it’s just fascinating how you can find traces of women photographers just from these random notices that you run across in the newspaper. 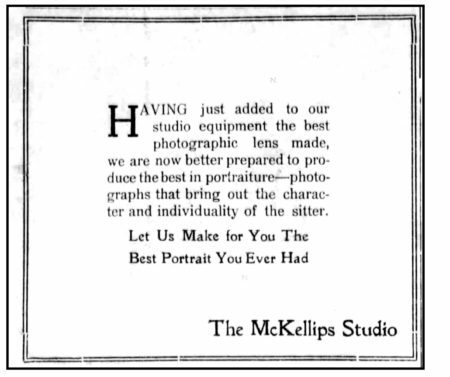 And then you start to realize what rich careers these women had as photographers, running studios, and in the case of the McKellips sisters, running studios not only in Beloit, Kansas, but also in other locations in Kansas, as well as in other states, like Oklahoma. And just like Margaret O’Donnell had the intersection with Myrtle McKellips in her career, the McKellips themselves also have an intersection with other female photographers in Beloit. Because there are notices in the paper that they hired other women along the way before they sell that studio in 1919. 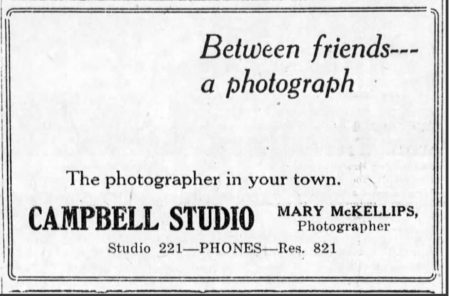 In 1919 when Mary and Myrtle sell their studio they place a big ad in the Beloit Daily Call saying that they have sold their studio to one Miss Amy Briner. And yes, that notice will indeed set us off on the trail of yet another woman running another studio in Beloit, Kansas in the early 20th century. I’m just fascinated by the fact that there were so many women that I’m uncovering in Beloit Kansas. It is just one place where these women who are running studios, employed, trained, and encouraged other women to take up running studios of their own. We’ll see that as a theme that crops up over and over as we get into more women here on Photographs, Pistols, and Parasols. For more information about any of the women photographers profiled on the podcast, visit my website, p3photographers.net. That’s letter “p”, number “3”, photographers.net.